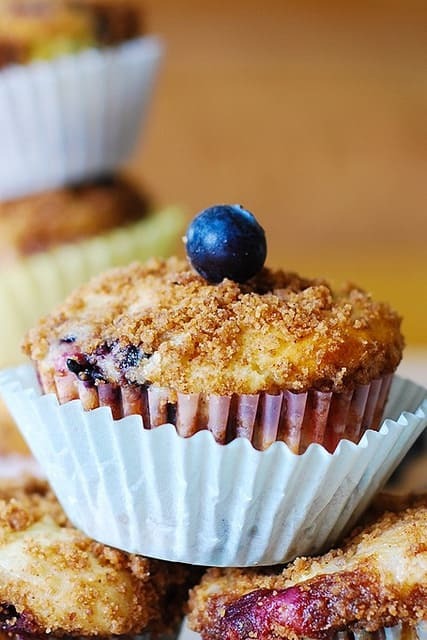 Easy Blueberry Muffins made with Greek yogurt and topped with brown sugar and cinnamon streusel. What makes a great blueberry muffin? To me, it’s all about a fresh-tasting muffin, packed with as many berries as the muffin batter can possibly hold. I prefer to use a small amount of butter/oil in quick breads/muffin recipes, replacing some of butter/oil with Greek yogurt, which makes muffins lighter and moister and healthier. I also love simple recipes without complicated steps especially when we’re talking about breakfast (I do not want to spend a lot of time on making my breakfast!). 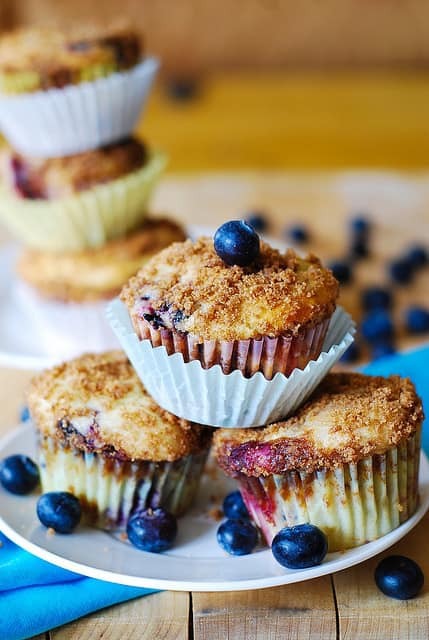 These easy blueberry muffins meet all of these humble requirements! I can’t even begin to tell you how much I love this recipe! These blueberry muffins will be gone very fast: you’ll have them for breakfast and dessert, and maybe even for lunch or brunch! These blueberry muffins are as perfect as muffins can get: moist and fruity, light and fluffy, rising and puffing up perfectly as they bake! I want to remind you not to over mix the batter too long, otherwise you will end up with dense, poorly risen muffins. If there are lumps in your batter – they will work themselves out during baking. Do not over mix is one of the most important rules when making most muffin recipes!! 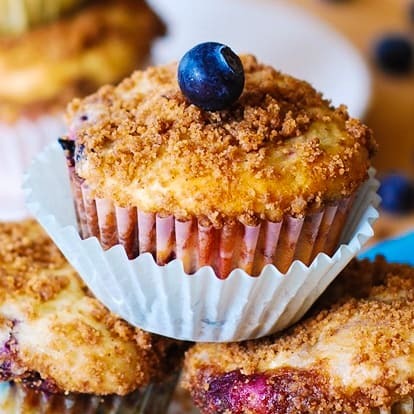 These muffins are already great as they are, but a moderate amount of a crunchy streusel topping makes them only better even though you can safely skip it. To make a perfect streusel crunchy topping, mix all ingredients (2/3 cup brown sugar, 1/3 cup flour, 1 teaspoon cinnamon, and 2 tablespoons butter, room temperature) with the fork until the mixture has a nice coarse texture. Add more flour if necessary. The topping should have a texture of a coarse meal, on a dry side. Then, sprinkle the topping over the muffins. Bake blueberry muffins for about 20 minutes and check if muffins are done right around the 20 minute mark by inserting a toothpick in the center. Let them cool completely before removing from the muffin pan. Enjoy! 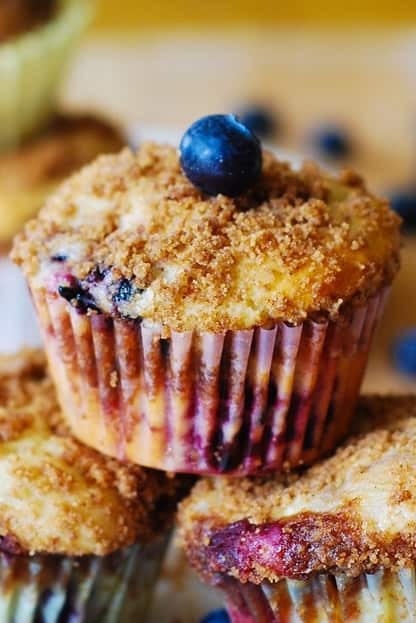 Easy Blueberry Muffins made with Greek yogurt and topped with brown sugar cinnamon streusel topping. This fresh-tasting muffin is packed with as many berries as the muffin batter can possibly hold. The muffins are light, fluffy and moist. Preheat oven to 400 degrees Fahrenheit. Line muffin cups with muffin liners or grease muffin cups lightly. Add flour mixture from step 2 to the liquid mixture in step 3 and mix just enough to combine. In a separate medium size bowl (the one you used in step 2), combine blueberries with 2 tablespoons of flour. This is supposed to prevent berries from clumping together and sinking. Fold in the berries into the batter from step 4. Fill muffin cups with the muffin batter about 3/4 full. 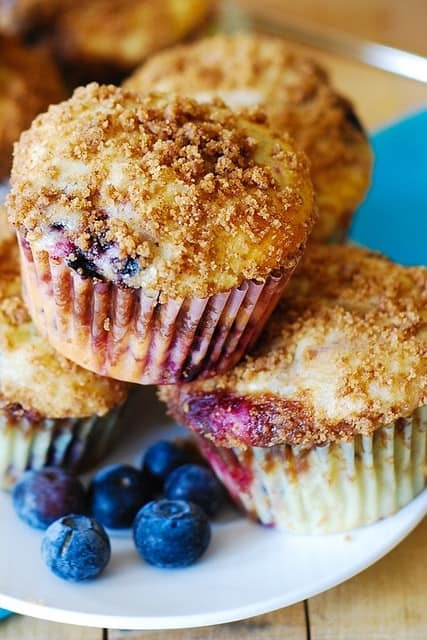 Sprinkle the streusel topping over muffins. Bake for about 20 minutes in the oven. I made this recipe twice, both times they were extremely dense and the flavor was off. ..any chance there’s a typo? ? I followed the recipe and my batter was more of a cookie dough batter. What happened?? What are the measurements in grams please? I love all your muffin recipes, Julia. They look so beautiful and delicious, and they make me very happy. The blueberry on top is super cute too 😉 Have a great day! These are so perfect looking!! yum!! Blueberry muffins are hands down my favorite type of muffins so these are exciting me a whole bunch! You’re so right – the crunchy topping makes the muffin! These are gorgeous! My favorite kind of muffin is blueberry! I can never resist these. Never. So I hope you have quite a few left! 😉 These look terrific — thanks. 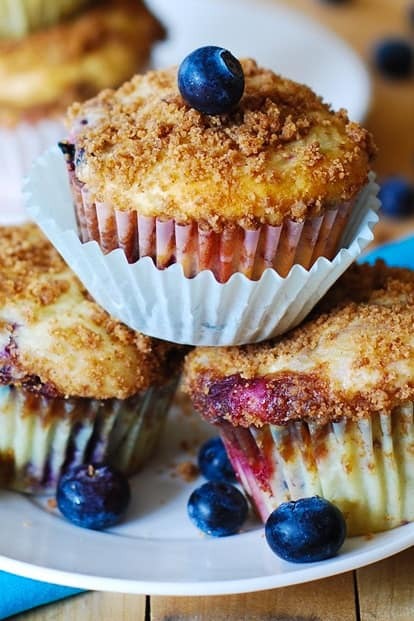 These look absolutely amazing, and that streusel topping just does me in!